Copyright ï¿½ 2004, 2008 International Business Machines Corp. NOTE that this article is obsolete; please see here instead. 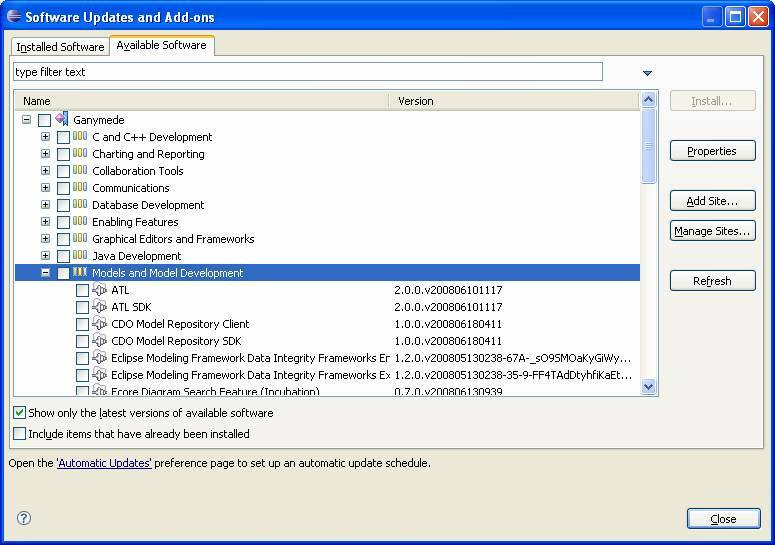 3) ï¿½Select the Available Software tab and expand the Ganymede\Model and Model Development tree item. 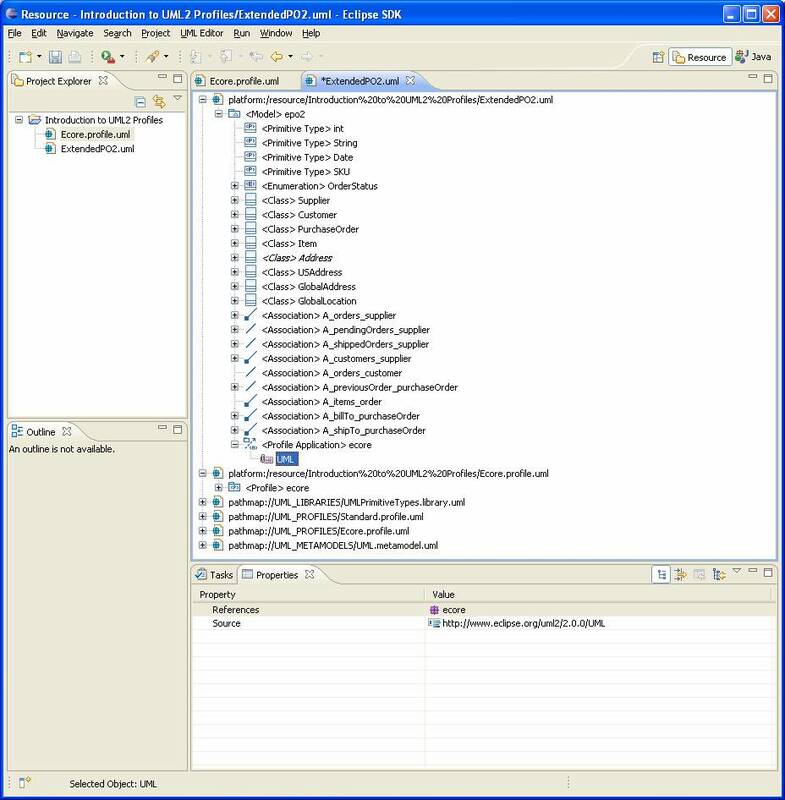 4) ï¿½Select UML2 End-User Features and UML2 Extender SDK.ï¿½ The version should indicate 2.2.0 (or later). At this stage, UML2 2.2 and all dependencies should be installed. This article will walk you through the basics of creating and applying profiles using UML2. Using a subset of the Ecore profile (see below) and the model we described in the ï¿½Getting Started with UML2ï¿½ article  (the ExtendedPO2 model, shamelessly ï¿½borrowedï¿½ from the EMF ï¿½bibleï¿½ ) as an example, weï¿½ll look at whatï¿½s involved in creating some of the more common elements that make up a profile. For each type of element, weï¿½ll first explain the creation process using the sample UML editor and explore how to accomplish the same thing using Java code. Then weï¿½ll look at whatï¿½s involved in applying profiles and stereotypes to models. The ExtendedPO2 model is shown below. As described in the EMF book, some of the attributes of certain Ecore elements cannot be expressed directly in UMLï¿½. EMF provides a Rose property file (ecore.pty) that defines all the non- UMLï¿½ properties needed to completely express an EMF model using Rational Rose. The same thing can be achieved for a UML2 model using a profile. The Ecore properties for attributes are shown below. These properties can be expressed in UML2 as properties owned by a stereotype that extends the Property metaclass. The Ecore properties for association ends are shown below. These properties can also be expressed in UML2 as properties owned by a stereotype that extends the Property metaclass. 1) Select the Window > Open Perspective > Otherï¿½ menu item. 2) Select the Resource perspective and press the OK button. 3) Select the File > New > Project... menu item. 4) Select the Project wizard from the General category and press the Next > button. 5) Enter a project name (i.e. ï¿½Introduction to UML2 Profilesï¿½), and press the Finish button. A static debug flag ï¿½can be used to enable or disable verbose information printed to the systemï¿½s output stream . Errors will always be printed to the systemï¿½s error stream . All righty then! In each of the following subsections, weï¿½ll look at how to create or manipulate a different kind of UML element, starting with profiles. 1) Select a project (i.e. Introduction to UML2 Profiles) in the Project Explorer view and select the File > New > Other... menu item. 2) Select the UML Model wizard from the Example EMF Model Creation Wizards category and press the Next > button. 3) Enter a file name (i.e. ï¿½Ecore.profile.umlï¿½) and press the Next > button. 4) Select Profile for the model object and press the Finish button. 5) Select the Window > Show View > Properties menu item. 6) Select the Profile element in the UML editor. 7) Enter a value (i.e. ï¿½ecoreï¿½) for the Name property in the Properties view. ï¿½By convention, resources that contain profiles end with a .profile.uml file extension in UML2. Letï¿½s look at how to perform the same task using Java code. The code snippet below shows a method that programmatically creates and returns a profile with a specified name. First, we ask the UML factory singleton ï¿½to create a profile, and we set its name . Then, we output information ï¿½to the user to let them know that the profile has been successfully created. Finally, we return ï¿½the profile. Youï¿½ll notice most, if not all, of the code snippets in this article will follow this pattern ï¿½ create the element (and set some properties on it), inform the user, and return it. 1) Select a package (i.e. <Profile> ecore) in the UML editor. 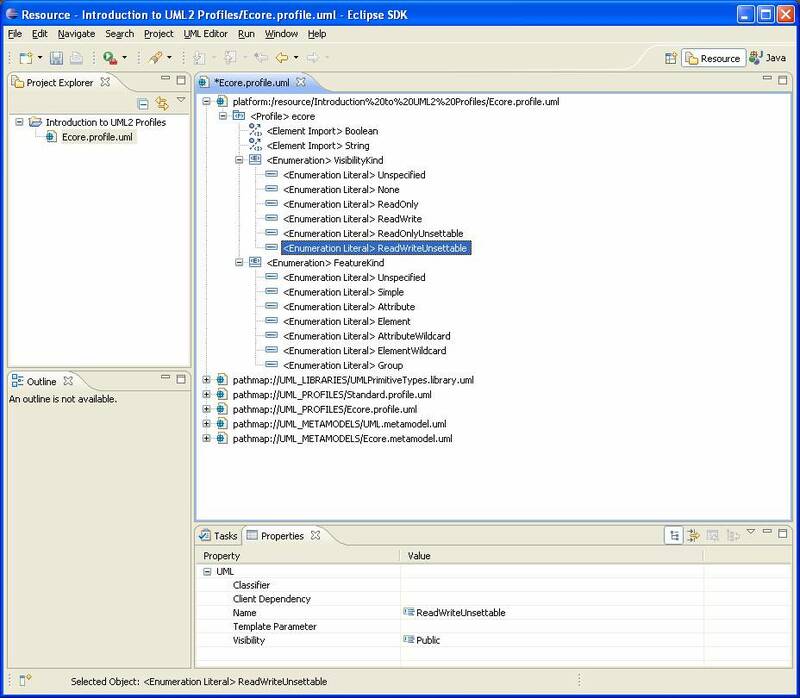 2) Select the UML Editor > Package > Import Typeï¿½ menu item. 3) Choose a primitive type (i.e. UMLPrimitiveTypes::Boolean), press the Add button, then press the OK button. 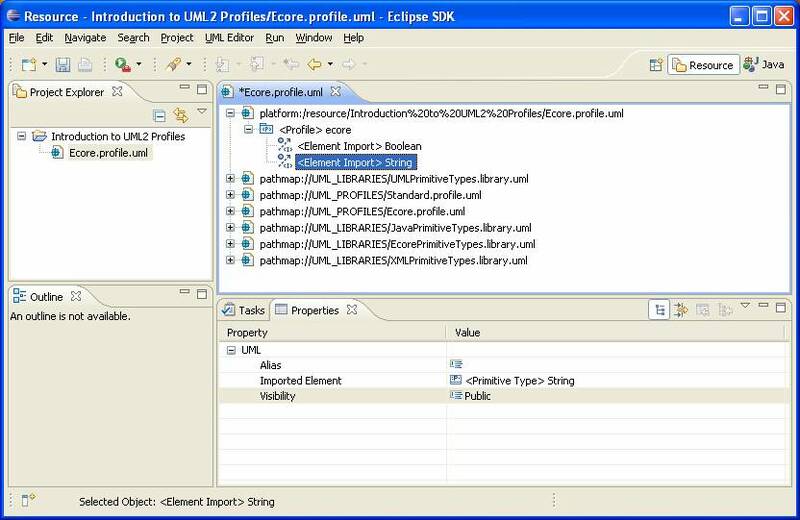 ï¿½Import the other required primitive type (UMLPrimitiveTypes::String) into the Ecore profile using the UML editor. Letï¿½s look at how to perform the same task using Java code. The code snippet below shows a method that programmatically imports the primitive type with a specified name from the UML primitive types library into a specified package and returns it. Here we load the model library ï¿½containing the UML primitive types (Boolean, Integer, String, and UnlimitedNatural) using a utility method (described later) and a URI defined on the UMLResource interface. Next, we retrieve the desired (owned) primitive type from the model by name ï¿½using one of the convenience methods defined in the UML2 API. Finally, we invoke another convenience method ï¿½to create the element import relationship between the package and the element (with default public visibility), notify the user, and return the primitive type. 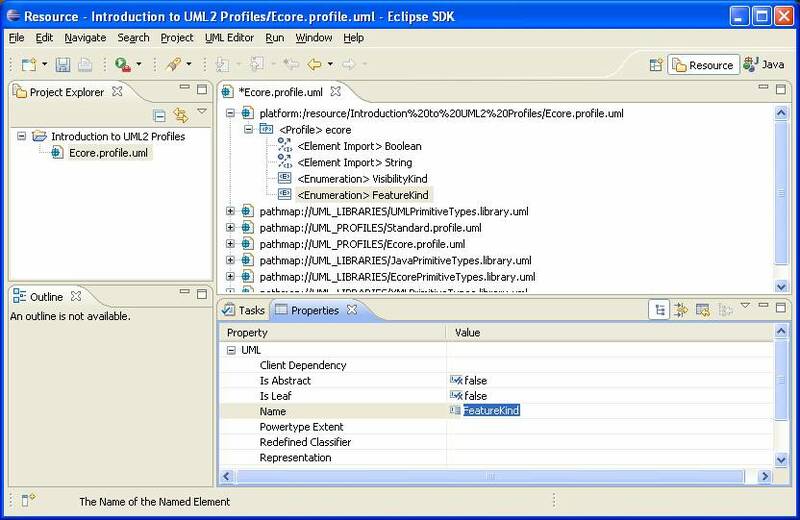 ï¿½The UML resources plug-in (org.eclipse.uml2.uml.resources) provides several model libraries (which by convention have a .library.uml file extension) that contain commonly used primitive types, such as those defined by Java and Ecore (in addition to those defined by UMLï¿½ itself). These libraries can be accessed using URIs defined on the UMLResource interface, as shown above. ï¿½In UML2, a method of the form get<feature name>(String) exists for every feature that can contain or reference named elements. In this case, the package has a feature (ownedType) that can contain types, so we pass the unqualified name of the type we are looking for to the getOwnedType(String) convenience method. Behind the scenes, the package will iterate over all of its owned types and return the first one that it finds that has the specified (unqualified) name. ï¿½Write code to programmatically import the other required primitive type (i.e. ï¿½Stringï¿½) into the Ecore profile. 1) Select a profile (i.e. <Profile> ecore) in the UML editor. 2) Right-click and select the New Child > Packaged Element > Enumeration option from the context menu. 3) Enter a value (i.e. ï¿½VisibilityKindï¿½) for the Name property in the Properties view. ï¿½Create the other enumeration (i.e. 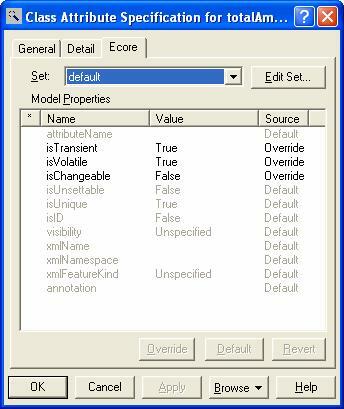 ï¿½FeatureKindï¿½) for the Ecore profile using the UML editor. Letï¿½s look at how to perform the same task using Java code. The code snippet below (from the GettingStartedWithUML2 class) shows a method that programmatically creates and returns an enumeration with a specified name in a specified package. Here we call the createOwnedEnumeration(String) convenience factory method ï¿½to ask the package to create a primitive type with the specified name as one of its packaged elements. ï¿½Write code to programmatically create the other enumeration (i.e. ï¿½FeatureKindï¿½) for the Ecore profile. 1) Select an enumeration (i.e. <Enumeration> VisibilityKind) in the UML editor. 2) Right-click and select the New Child > Owned Literal > Enumeration Literal option from the context menu. 3) Enter a value (i.e. ï¿½Unspecifiedï¿½) for the Name property in the Properties view. 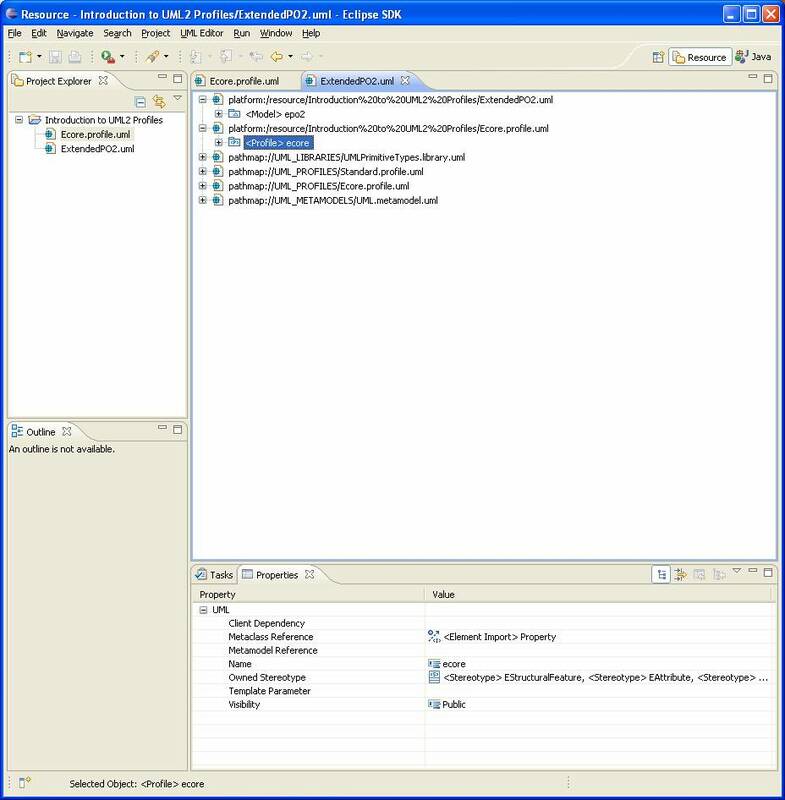 ï¿½Create the remaining enumeration literals for the Ecore profile (i.e. ï¿½Noneï¿½, ï¿½ReadOnlyï¿½, ï¿½ReadWriteï¿½, ï¿½ReadOnlyUnsettableï¿½, and ï¿½ReadWriteUnsettableï¿½ for <Enumeration> VisibilityKind; ï¿½Unspecifiedï¿½, ï¿½Simpleï¿½, ï¿½Attributeï¿½, ï¿½Elementï¿½, ï¿½AttributeWildcardï¿½, ï¿½ElementWildcardï¿½, and ï¿½Groupï¿½ for <Enumeration FeatureKind>) using the UML editor. Letï¿½s look at how to perform the same task using Java code. The code snippet below (from the GettingStartedWithUML2 class) shows a method that programmatically creates and returns an enumeration literal with a specified name in a specified enumeration. Here we call the createOwnedLiteral(String) convenience factory method ï¿½to ask the enumeration to create an enumeration literal with the specified name as one of its owned literals. ï¿½Write code to programmatically create the remaining enumeration literals (i.e. ï¿½Noneï¿½, ï¿½ReadOnlyï¿½, ï¿½ReadWriteï¿½, ï¿½ReadOnlyUnsettableï¿½, and ï¿½ReadWriteUnsettableï¿½ in enumeration ï¿½VisibilityKindï¿½; ï¿½Unspecifiedï¿½, ï¿½Simpleï¿½, ï¿½Attributeï¿½, ï¿½Elementï¿½, ï¿½AttributeWildcardï¿½, ï¿½ElementWildcardï¿½, and ï¿½Groupï¿½ in enumeration ï¿½FeatureKindï¿½) for the Ecore profile. 2) Right-click and select the New Child > Packaged Element > Stereotype option from the context menu. 3) Enter a value (i.e. ï¿½EStructuralFeatureï¿½) for the Name property in the Properties view. 4) Select a value (i.e. true) for the Is Abstract property in the Properties view. ï¿½Create the remaining stereotypes for the Ecore profile (i.e. ï¿½EAttributeï¿½ and ï¿½EReferenceï¿½) using the UML editor. Letï¿½s look at how to perform the same task using Java code. The code snippet below shows a method that programmatically creates and returns a(n) (abstract) stereotype with a specified name in a specified profile. Here we call the createOwnedStereotype(String, boolean) convenience factory method ï¿½to ask the profile to create a stereotype with the specified name as one of its owned members, and set the isAbstract attribute of the stereotype based on the specified boolean argument. ï¿½Write code to programmatically create the remaining (non-abstract) stereotypes (i.e. ï¿½EAttributeï¿½ and ï¿½EReferenceï¿½) for the Ecore profile. 1) Select a stereotype (i.e. <Stereotype> EAttribute) in the UML editor. 2) Right-click and select the New Child > Generalization > Generalization option from the context menu. 3) Select a value (i.e. ecore::EStructuralFeature) for the General property in the Properties view. ï¿½Create the other generalization (i.e. between EReference and EStructuralFeature) for the Ecore profile using the UML editor. ï¿½Be sure to pick the stereotype (the first ecore::EStructuralFeature item) and not the class (it should show up in Properties view as <Stereotype> EStructuralFeature, not <Class> EStructuralFeature), which comes from the Ecore metamodel. Letï¿½s look at how to perform the same task using Java code. The code snippet below (from the GettingStartedWithUML2 class) shows a method that programmatically creates and returns generalization between specified specific and general classifiers. ï¿½ï¿½ï¿½ï¿½ï¿½ï¿½ï¿½ï¿½ï¿½ï¿½ï¿½ out("Generalization " + specificClassifier.getQualifiedName() + " ->> "
Here we call a convenience factory method on the specific classifier that creates a generalization ï¿½as one of its children and sets the general classifier to the specified argument. ï¿½Write code to programmatically create the other generalization (i.e. between ï¿½EReferenceï¿½ and ï¿½EStructuralFeatureï¿½) for the Ecore profile. 1) Select a stereotype (i.e. <Stereotype> EStructuralFeature) in the UML editor. 2) Right-click and select the New Child > Owned Attribute > Property option from the context menu. 3) Enter a value (i.e. "isTransientï¿½) for the Name property in the Properties view. 4) Select a value (i.e. UMLPrimitiveTypes::Boolean) for the Type property in the Properties view. 5) Enter a value (i.e. 0) for the Lower property in the Properties view. 6) Select the property (i.e. <Property> isTransient) in the UML editor. 7) Right-click and select the New Child > Default Value Literal Boolean option from the context menu. ï¿½Default values for properties (and parameters) are represented as value specifications (first-class objects) in UMLï¿½ 2.0. Here we have selected a literal Boolean (whose default value is false) as the default value of our property since its type is Boolean. If the type of the property were String, weï¿½d have used a literal string instead. Once a default value specification has been created, its value can alternatively be set with the owning property selected via the Default property in the Properties view. ï¿½Create the remaining stereotype properties for the Ecore profile (i.e. ï¿½isUnsettableï¿½, ï¿½isVolatileï¿½, ï¿½visibilityï¿½, ï¿½xmlNameï¿½, ï¿½xmlNamespaceï¿½, and ï¿½xmlFeatureKindï¿½ for <Stereotype> EStructuralFeature; ï¿½attributeNameï¿½ and ï¿½isIDï¿½ for <Stereotype> EAttribute; ï¿½referenceNameï¿½ and ï¿½isResolveProxiesï¿½ for <Stereotype> EReference) using the UML editor. ï¿½Be sure to set the appropriate default value for each stereotype property so that it is consistent with the corresponding Ecore property for Rose. In particular, the default value for the ï¿½isResolveProxiesï¿½ should be a literal Boolean with a value of true instead of the default (!) default value of false. Note also that the types of the ï¿½visibilityï¿½ and ï¿½xmlFeatureKindï¿½ properties should be the enumerations we created earlier (i.e. ecore::Visibility and ecore::FeatureKind, respectively). Letï¿½s look at how to perform the same task using Java code. The code snippet below (from the GettingStartedWithUML2 class) shows a method that programmatically creates and returns an attribute with a specified upper bound, lower bound, type, and name in a specified class. Here we call the createOwnedAttribute(String, Type, int, int) convenience factory method ï¿½to ask the class to create a property as one of its owned attributes, set the type of the attribute to the specified type, and set the lower and upper bounds of the attribute (the factory method creates a literal integer and literal unlimited natural, respectively, and sets its value to the specified integer value). ï¿½The LiteralUnlimitedNatural.UNLIMITED constant represents the unlimited value for upper bounds (-1), as it does in EMF. ï¿½Write code to programmatically create the remaining stereotype properties (i.e. ï¿½isUnsettableï¿½, ï¿½isVolatileï¿½, ï¿½visibilityï¿½, ï¿½xmlNameï¿½, ï¿½xmlNamespaceï¿½, and ï¿½xmlFeatureKindï¿½ in stereotype ï¿½EStructuralFeatureï¿½; ï¿½attributeNameï¿½ and ï¿½isIDï¿½ in stereotype ï¿½EAttributeï¿½; ï¿½referenceNameï¿½ and ï¿½isResolveProxiesï¿½ in stereotype ï¿½EReferenceï¿½) for the Ecore profile. 2) Select the UML Editor > Profile > Reference Metaclassï¿½ menu item. 3) Choose a metaclass (i.e. uml::Property), press the Add button, then press the OK button. Letï¿½s look at how to perform the same task using Java code. The code snippet below shows a method that programmatically references the metaclass with a specified name in the UML metamodel from a specified profile and returns it. Here we load the metamodel ï¿½containing the UML metaclasses using a utility method (described later) and a URI defined on the UMLResource interface. Next, we retrieve the desired (owned) metaclass from the (meta)model by name ï¿½using the convenience method. Finally, we invoke another convenience method ï¿½to create the element import relationship between the profile and the metaclass, notify the user, and return the metaclass. 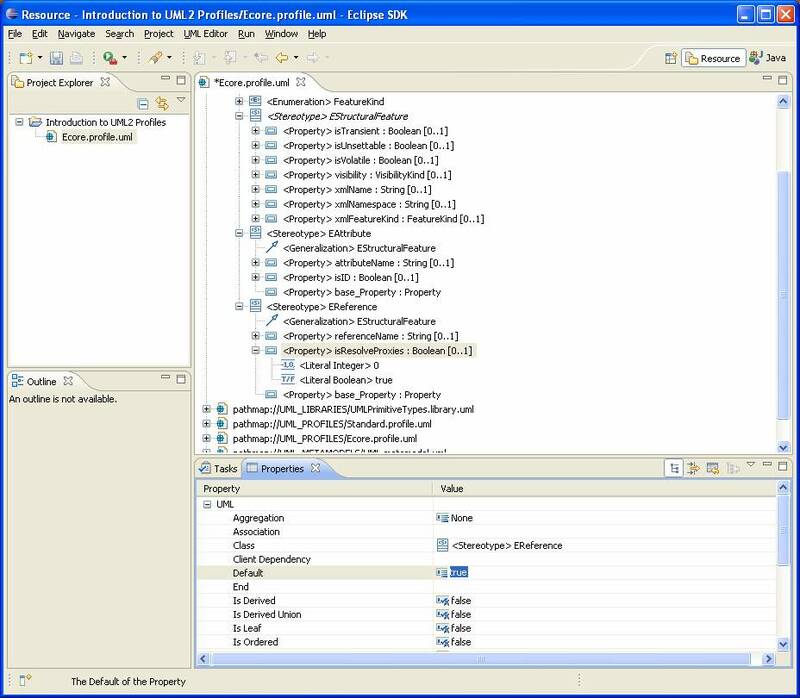 ï¿½The UML resources plug-in (org.eclipse.uml2.uml.resources) provides two metamodels (which by convention have a .metamodel.uml file extension), UML2 and Ecore. These metamodels can be accessed using URIs defined on the UMLResource interface, as shown above. 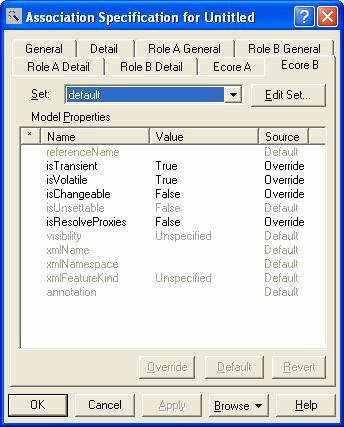 2) Select the UML Editor > Stereotype > Create Extensionï¿½ menu item. ï¿½Create the other extension (i.e. between uml::Property and <Stereotype> EReference) for the Ecore profile using the UML editor. ï¿½Youï¿½ll notice that a number of new elements have appeared in the UML editor. In particular, youï¿½ll see a new stereotype property with a name of the form base_<metaclass name>, an extension with a name of the form <metaclass name>_<stereotype name>, and an extension end with a name of the form extension_<stereotype name>. Itï¿½s important that these elements not be modified, since the UML2 profile mechanism depends on these constructs. Letï¿½s look at how to perform the same task using Java code. The code snippet below shows a method that programmatically creates and returns a(n) (required) extension between a specified metaclass and a specified stereotype. ï¿½ï¿½ï¿½ï¿½ï¿½ï¿½ï¿½ï¿½ï¿½ï¿½ï¿½ï¿½ï¿½ï¿½ï¿½ï¿½ï¿½ï¿½ï¿½ ? "Required extension '"
Here we call a convenience method on the stereotype that creates an extension (and its ends) between it and a metaclass ï¿½as one of its siblings (i.e. as a child of its profile namespace). Behind the scenes, the stereotype also creates the ends of the extension, resulting in a new property on the stereotype (with a special name) and an extension end owned by the extension (again, with a special name). ï¿½Write code to programmatically create the other extension (i.e. between metaclass ï¿½Propertyï¿½ and stereotype ï¿½EReferenceï¿½) for the Ecore profile. 2) Select the UML Editor > Profile > Define menu item. 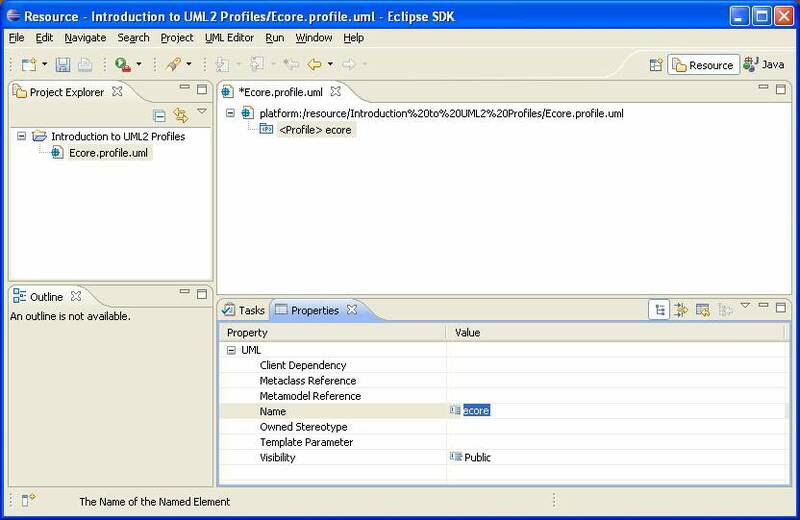 ï¿½Youï¿½ll notice that an annotation with source http://www.eclipse.org/uml2/2.0.0/UML has been attached to the profile. It contains the generated Ecore representation (an Ecore package with classes, attributes, enums, etc.) of the profile. As with extensions, itï¿½s important that this annotation (and its contents) not be modified, since the UML2 profile mechanism depends on these constructs. Letï¿½s look at how to perform the same task using Java code. The code snippet below shows a method that programmatically defines a specified profile. Here we call a convenience method on the profile ï¿½that generates the Ecore representation of the profile and increments its version. 1) Select the File > Save menu item. Itï¿½s that simple. Programmatically, we have a bit more work to do because so far, weï¿½ve been creating our profile in a vacuum, i.e. without a containing resource. The code snippet below shows a method that saves a specified package to a resource with a specified URI. Here we use a statically initialized resource set ï¿½to create a resource with the specified URI, add the package to the resourceï¿½s contents , and ask the resource to save itself ï¿½using the default options. If an exception occurs, we notify the user ï¿½via our handy utility method. ï¿½The UMLResource.PROFILE_FILE_EXTENSION constant represents the file extension for UML2 profiles (.profile.uml). In order to make use of our profile, weï¿½ll need to open a model and load the profile. Weï¿½ll use the ExtendedPO2 model that was created in the ï¿½Getting Started with UML2ï¿½ article (youï¿½ll need to copy it into your project and refresh the workspace first). 1) Double-click on the resource (i.e. ExtendedPO2.uml) in the Navigator view. 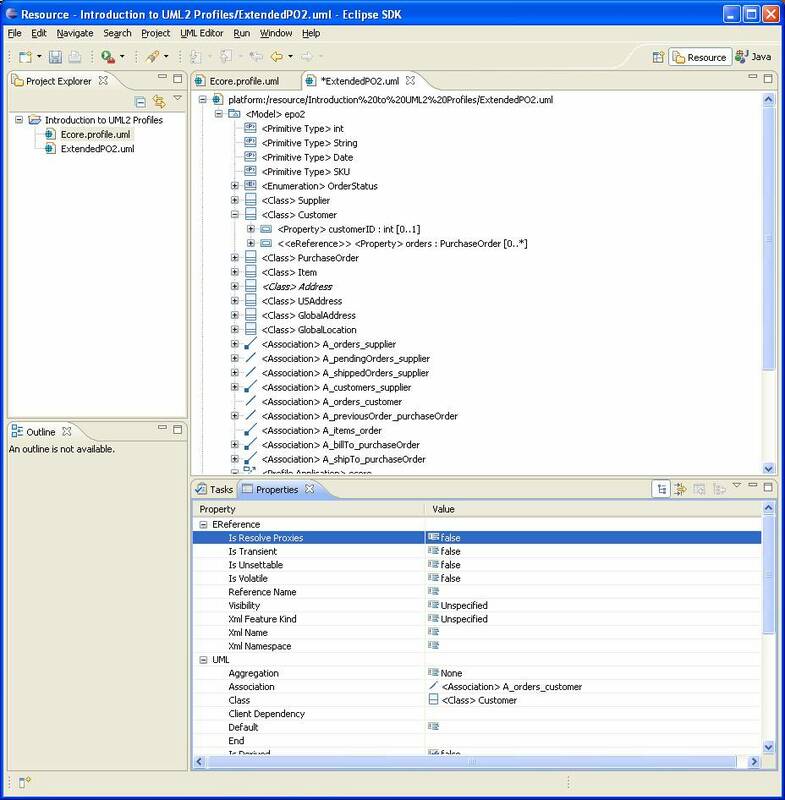 Behind the scenes, a resource is obtained from the right kind resource factory (based on the extension ï¿½.umlï¿½) and loaded, and then a new UML editor is opened and populated with the resourceï¿½s contents. 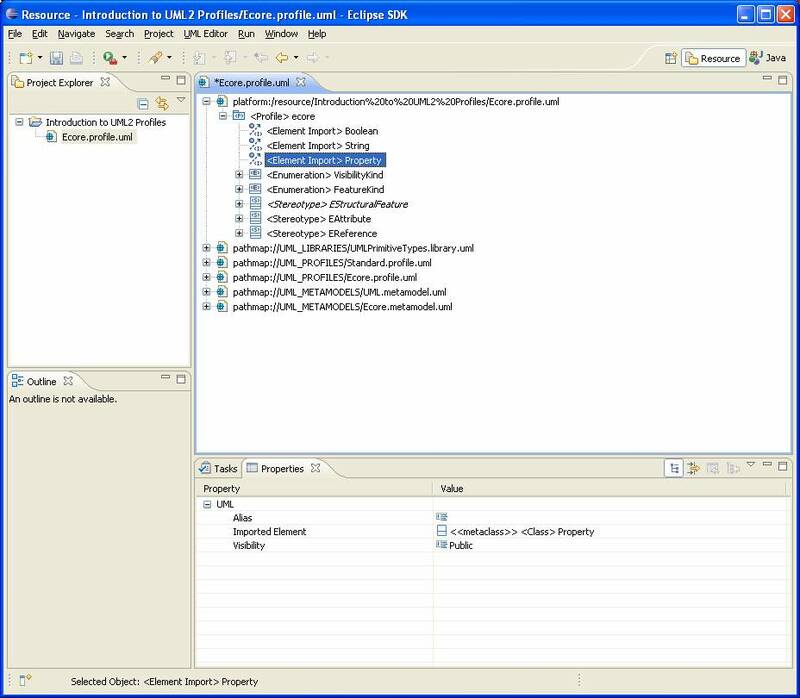 1) Select the UML Editor > Load Resourceï¿½ menu item. 2) Press the Browse Workspaceï¿½ button. 3) Select a resource (i.e. 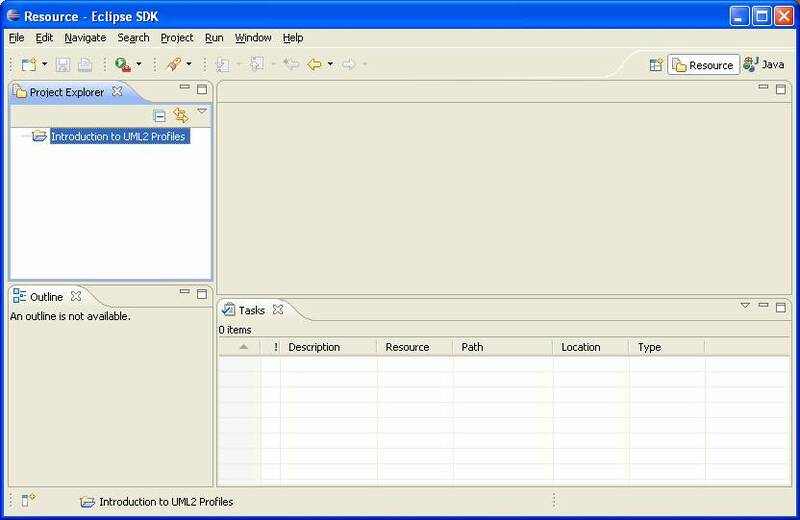 Introduction to UML2 Profiles/Ecore.profile.uml) and press the OK button. Here we obtain a resource with the specified URI from our statically initialized resource set , asking that it be loaded on demand. Next, we use an EMF utility method ï¿½to obtain the first object of type Package from the resourceï¿½s contents. If an exception occurs, we notify the user ï¿½via our handy utility method. Finally, if all is well, we return ï¿½the package. ï¿½The EcoreUtil class (provided by EMF) defines a number of utilities that you may find quite useful when working with EMF-based resources. 1) Select a package (i.e. <Model> epo2) in the UML editor. 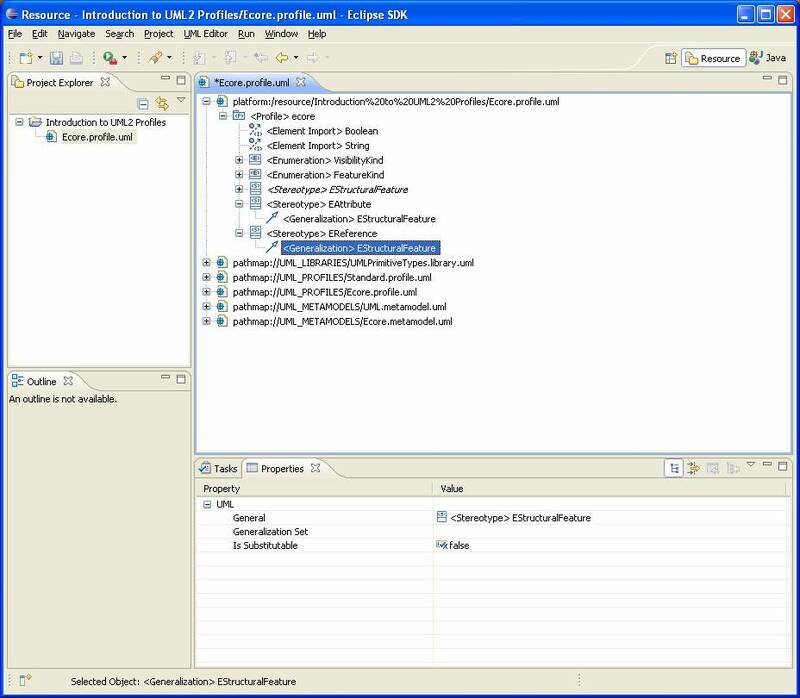 2) Select the UML Editor > Package > Apply Profileï¿½ menu item. 3) Choose a profile (i.e. ecore), press the Add button, then press the OK button. ï¿½Be sure to pick the profile weï¿½ve created instead of the built-in profile provided by the UML resources plug-in (i.e. ecore, not Ecore). ï¿½Youï¿½ll notice another annotation (with source http://www.eclipse.org/uml2/2.0.0/UML) has been attached, in this case to keep track of the Ecore representation for the definition of the profile that is currently applied to the package. Again, itï¿½s important that this annotation not be modified, since the UML2 profile mechanism depends on this construct. 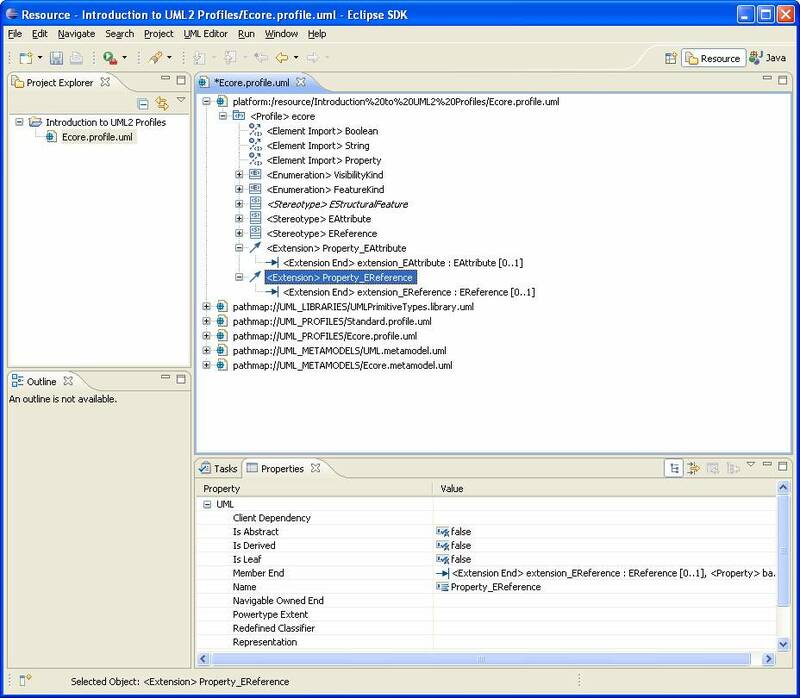 Note that a newer definition of the profile can be applied using the same menu item, and a profile (along with all of its stereotypes) can be unapplied using the UML Editor > Package > Unapply Profileï¿½ menu item. Letï¿½s look at how to perform the same task using Java code. The code snippet below shows a method that programmatically applies a specified profile to a specified package. ï¿½ï¿½ï¿½ï¿½ï¿½ï¿½ï¿½ï¿½ï¿½ï¿½ï¿½ out("Profile '" + profile.getQualifiedName() + "' applied to package '"
Here we call a convenience method on the package ï¿½that creates a profile application on the package and sets the profile as the imported profile. 1) Select an element (i.e. <Property> pendingOrders : PurchaseOrder [0..*] in <Class> Supplier) in the UML editor. 2) Select the UML Editor > Element > Apply Stereotypeï¿½ menu item. 3) Choose a stereotype (i.e. ecore::EReference), press the Add button, then press the OK button. ï¿½Apply the appropriate stereotypes to other properties (<Property> shippedOrders : PurchaseOrder [0..*] in <Class> Supplier; <Property> totalAmount : int [0..1], <Property> previousOrder : PurchaseOrder [0..1], and <Property> customer : Customer in <Class> PurchaseOrder; <Property> orders : PurchaseOrder [0..*] in <Class> Customer) in the ExtendedPO2 model using the UML editor. ï¿½A stereotype (and its tagged values) can be unapplied using the UML Editor > Element > Unapply Stereotypeï¿½ menu item. Letï¿½s look at how to perform the same task using Java code. The code snippet below shows a method that programmatically applies a specified stereotype to a specified (named) element. Here we call a convenience method on the element ï¿½that creates an instance of the Ecore class representing the specified stereotype (using dynamic EMF) and attaches it to the element using an annotation. ï¿½Write code to programmatically apply the appropriate stereotypes to other properties (i.e. ï¿½epo2::Supplier::shippedOrdersï¿½, ï¿½epo2::PurchaseOrder::totalAmountï¿½, ï¿½epo2::PurchaseOrder::previousOrderï¿½, ï¿½epo2::PurchaseOrder::customerï¿½, and ï¿½epo2::Customer::ordersï¿½) in the ExtendedPO2 model. 1) Select the element to which the stereotyped has been applied (i.e. <<eReference>> <Property> pendingOrders : PurchaseOrder [0..*] in <Class> Supplier) in the UML editor. 2) Enter or select a value (i.e. false) for the property (i.e. Is Resolve Proxies) under the category named for the stereotype (i.e. EReference) in the Properties view. ï¿½Get and set values for other stereotype properties (i.e. Is Transient and Is Resolve Proxies under EReference for <<eReference>> <Property> pendingOrders : PurchaseOrder [0..*] in <Class> Supplier; Is Volatile, Is Transient, and Is Resolve Proxies under EReference for <<eReference>> <Property> shippedOrders : PurchaseOrder [0..*] in <Class> Supplier; Is Volatile and Is Transient under EAttribute for <<eAttribute>> <Property> totalAmount : int [0..1] in <Class> PurchaseOrder; Is Resolve Proxies under EReference for <<eReference>> <Property> previousOrder : PurchaseOrder [0..1] in <Class> PurchaseOrder; Is Resolve Proxies under EReference for <<eReference>> <Property> customer : Customer in <Class> PurchaseOrder; Is Resolve Proxies under EReference for <<eReference>> <Property> orders : PurchaseOrder [0..*] in <Class> Customer) in the ExtendedPO2 model using the UML editor. Letï¿½s look at how to perform the same task using Java code. The code snippet below shows a method that programmatically gets and returns the value of a specified property of a specified stereotype for a specified element. ï¿½ï¿½ï¿½ï¿½ï¿½ï¿½ï¿½ï¿½ï¿½ï¿½ï¿½ï¿½ï¿½ï¿½ï¿½ï¿½ï¿½ï¿½ + "' on element '" + namedElement.getQualifiedName() + "' is "
Here we call a convenience method on the (named) element ï¿½that retrieves the value of a property with a specified name from the dynamically created Ecore object instance corresponding to the specified applied stereotype, notifies the user, and returns it. ï¿½Write code to programmatically get the values of the other stereotype properties for elements in the ExtendedPO2 model. ï¿½ï¿½ï¿½ï¿½ï¿½ï¿½ï¿½ï¿½ï¿½ï¿½ï¿½ï¿½ï¿½ï¿½ï¿½ï¿½ï¿½ï¿½ + "' on element '" + namedElement.getQualifiedName() + "' set to "
Here we call a convenience method on the (named) element ï¿½that sets the value of a property with a specified name in the dynamically created Ecore object instance corresponding to the specified applied stereotype and notifies the user. ï¿½Write code to programmatically set the values of the other stereotype properties for elements in the ExtendedPO2 model. Congratulations! If youï¿½ve made it this far, youï¿½ve successfully created and applied a simple profile programmatically and/or using the UML editor. Thereï¿½s a whole lot more that could be said, but the purpose of this article was just to introduce you to the concepts. Stay tuned for more articles on how to develop tools with UML2. For more information on UML2, visit the home page or join the newsgroup. K. Hussey. ï¿½Getting Started with UML2ï¿½. International Business Machines Corp., 2004, 2006. 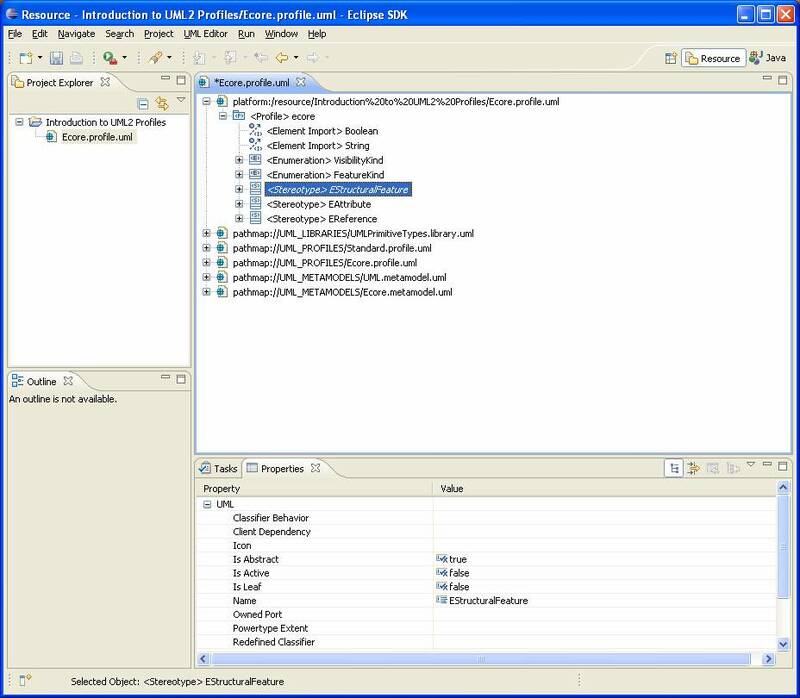 To run the example or view the source code for this article, unzip uml2.articles_200607181325.zip into your Eclipse home directory and import the com.ibm.uml2.articles plug-in into your workspace as a binary project with linked content (File > Importï¿½ > External Plug-ins and Fragments). You can run the IntroductionToUML2Profiles class as a Java application with two file URIs (e.g. ï¿½file:/C:/Introduction to UML2 Profilesï¿½ ï¿½jar:file:/C:/Eclipse 3.2/eclipse/plugins/org.eclipse.uml2.uml.resources_2.0.0.v200606221411.jar!/ï¿½) as program arguments. The first URI should refer to a folder that contains the ExtendedPO2 model described in the ï¿½Getting Started with UML2ï¿½ article. 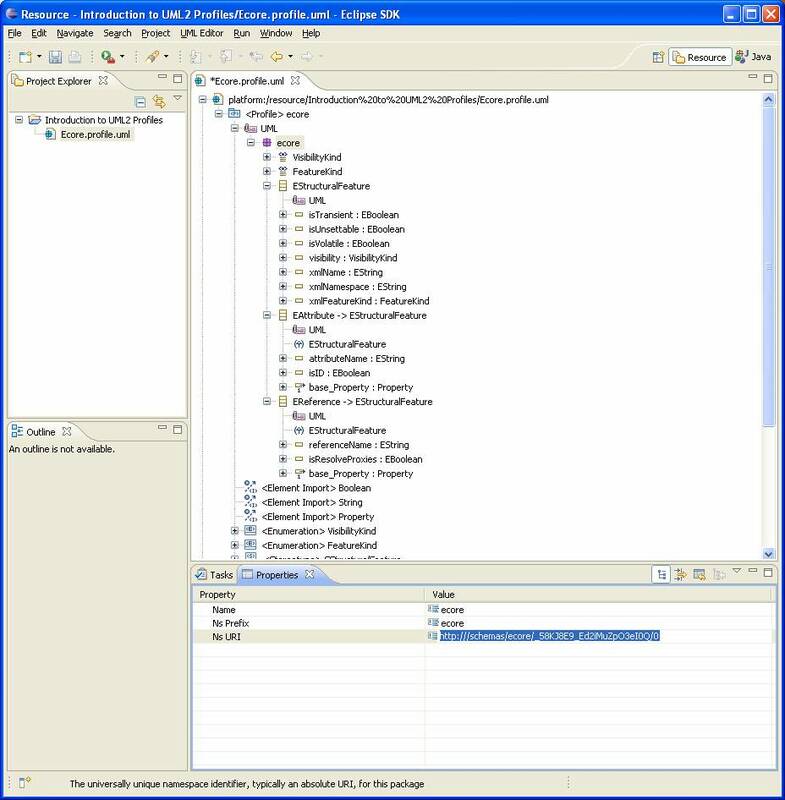 The second URI should use the JAR scheme (since the UML resources plug-in is JARï¿½d as of UML2 1.1) and refer to the location of the org.eclipse.uml2.uml.resources plug-inï¿½s JAR archive.